Medeama SC has defeated Kumasi Asante Kotoko today by a goal to neil to hand them their first defeat in the Ghana Football Association (GFA) Normalization Committee (NC) Special Competition. The two Premier League Giants faced off in Match Day-2 encounter at the T&A Park. 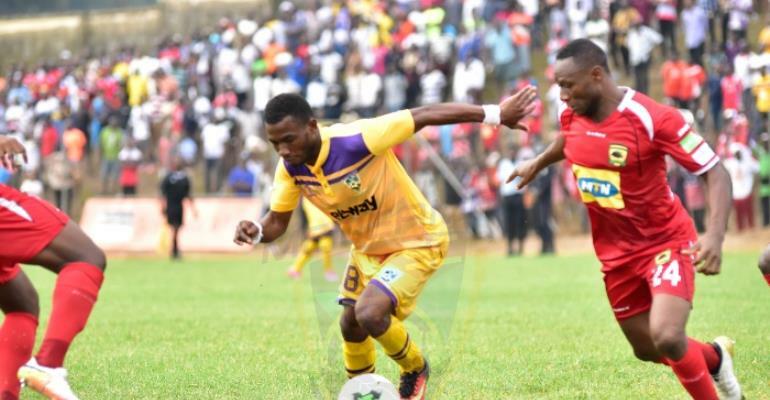 Despite the Porcupine Warriors going into the match as favorites, their performance could not merit any point as they succumbed to the narrow defeat at the hands of Medeama SC. A solid performance from the home team on a top of a compact defending finally paid off when they were awarded a penalty on the 35th minute after defender Abass Mohammed handled the ball on the goal line to deny Kwame Boateng from scoring. The Medeama attacker would not be denied the second time however as he stepped up to take the spot kick. The experienced played sent the goalkeeper the wrong way as he expertly slotted the kick into the back of the net. With one outstanding match to spare, the victory for Medeama means they are well placed on the Zone A log of the Special Competition. They will host Wa All stars in their next match over the weekend. For Kotoko, the painful loss puts pressure on them to win their next match if they still want to qualify for Africa next season. They will travel to Nkoranza to play as guest to Techiman Eleven Wonders on Sunday. Kickoff time for the match is at 3:00pm. Medeama Team News For Asante Kotoko clash. Eric Ofori Antwi (GK), Samuel Appiah, Bright Enchil, Yussif Musah, Daniel Egyin, Camara N’guessan Hermann, Rashid Nortey, Justice Blay, Joseph Tetteh Zutah (C), Kwame Boateng, Tahiru A.